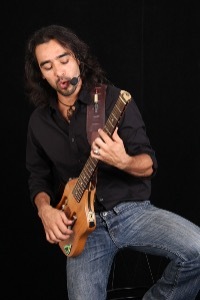 Richie Castro is a cultural storyteller/ musician. he has been called a modern-day troubadour who has spent the last 18 years sharing his passion, talent and love of music with people all over the world. He is a true traveling musician; he has lived and performed in Asia, Europe, Mexico and throughout the United States. Over the last 10 years Richie has been performing educational storytelling shows for children in schools, libraries and theaters. Recently he has developed another exciting project which is inspired by his years of music and travel. His latest creation, "The History Hunter Project" includes a multi-act musical stage production, teaching world history through Music , storytelling and theatrics! 8 song CD complete with sing-along comic book, as well as live performances in the United States and Canada. The aspiration of the History Hunter project is to inspire young audiences with songs and stories of Courage,Compassion, Confidence and Hope.